Citation: Venyo AKG. Cryotherapy in the treatment of small renal tumors over the recent years: A review of the literature and update. Pulsus J Surg Res. 2018;2(2):69-75. Cryotherapy is an ablative treatment option for the management of various malignancies which tends to be associated with less morbidity in comparison with conventional extirpative surgical excision procedures. Over recent years cryotherapy has been successfully utilized in some centres in the treatment of carcinomas of the kidney and carcinomas of the prostate gland . Because cryotherapy of carcinomas of the kidney do not tend to be undertaken in the majority of hospitals globally many clinicians could be unaware of the potential usefulness of cryotherapy of kidney tumors as an option of treatment in certain situations. The ensuing article contains a review of the literature on cryotherapy of tumors that have been recently undertaken globally and this has been divided into (A) overview and (B) miscellaneous narrations from reported cases and studies. Cryotherapy is a terminology which refers to the local or general use of low temperatures in medical therapy. Cryotherapy is utilized to treat various benign and malignant lesions of the body  Cryotherapy is a medical terminology which was derived from Greek; “Cryo” which means cold and “therapy” which means a cure. Mechanism of action: The mechanism of cryotherapy could be divided into 3 phases: (1) Heat transfer, (2) Cell injury, and (3) Inflammation . Complications: Some complications can occur with the utilization of cryotherapy to treat different lesions and in general irrespective of which lesion or lesions are being treated the complications of cryotherapy can be divided into (1) acute complications; (2) delayed complications; (3) prolonged-temporary complications; (4) permanent complications . With regards to treatment of carcinoma of the kidney by cryotherapy it is important to establish at the end of the cryotherapy procedure whether there has been complete resolution of the lesion at the end of the procedure or there is residual disease or there will subsequently be development of local recurrence or distant metastasis and for this reason radiological imaging tends to be undertaken at the end of the procedure, and subsequent radiological imaging at 1 month, 6 months, one year and yearly after that in some cases. Contraindications: Contraindications to cryotherapy can be divided into two groups as (a) relative contraindications; and (b) absolute contraindications . Relative contraindications: Relative contraindications for the utilization of cryotherapy include (a) cold intolerance; (b) cold urticaria; (c) cryoglobulinemia; (d) previous history of pyoderma gangrenosum; and (e) Raynaud disease . Absolute contraindications: The use of cryotherapy near the margin of the eye is an absolute contraindication . Aboumarzouk et al.,  concluded that laparoscopic cryoablation of renal tumors was found to be associated with less incomplete tumor ablation rates and with higher cancer-specific survival rates; nevertheless, higher time of hospitalization, more major complications that amounted to Clavien -III complications, and laparoscopic cryoablation procedures were more expensive in comparison with the percutaneous ablation procedures. It would be argued that cryotherapy as treatment for small renal tumors at the moment is not a widely adopted form of treatment for small renal tumors and that before cryotherapy is globally adopted as an alternative standard treatment, it would be a good idea to undertake a large multicenter trial that would compare cryotherapy with partial nephrectomy for small renal tumors to ascertain the comparative long-period outcomes of both treatment modalities. Enikeev et al.,  made the ensuing conclusions: Their accumulated experience had enabled them to confirm the effectiveness and safety of ultrasound scan-guided percutaneous cryo-ablation and which had enabled them to recommend ultrasound scan guided per-cutaneous cryo-ablation of renal tumors as a treatment modality of choice for patients who have Stage T1a carcinoma of the kidney which is positioned along the posterior and lateral surface of the kidney within the lower and middle segment of the kidney without renal sinus invasion. It would be argued that despite the promising short-term outcome reported by Enikeev et al.,  a long period of follow-up is required with regards to the treatment of malignant lesions and even though the short term outcome pursuant to cryotherapy for small renal tumors in this study appears promising, there is need to undertake a large-scale multi-centre study that has a long period of follow-up to confirm the long-term outcome of cryotherapy to enable clinicians decide globally whether to accept cryotherapy as a good treatment option for small malignant renal tumors or not. It would be argued that Pessoa et al.,  had done a good job comparing laparoscopic cryo-ablation with percutaneous cryo-ablation of small renal tumors; however, what is needed is a comparison of cryotherapy with standard partial nephrectomy associated with a long period of follow-up to enable clinicians decide whether to regard cryotherapy as an alternative treatment option for small renal tumors that are associated with good longterm outcome as partial nephrectomy or not. Bertolotto et al.,  concluded that pursuant to cryo-ablation, intratumoral enhancement on contrast-enhanced sonography does not imply there is the viability of tumor cell. It would be argued that these initial results are promising but there is a need for a larger study with a long period of follow-up to ascertain the outcome of this treatment modality over a longer period of time. Lalloue et al.,  concluded that percutaneous cryo-ablation provides a safe and oncologically effective treatment option to extirpative surgery for kidney masses in patients who have significant co-morbidities. Whilst these results would appear promising, a much longer period of follow-up in a similar type of study would be necessary with regards to understanding the long-term outcome of treating small renal tumors by means of radiotherapy. Dominguez et al.,  concluded that Laparoscopic cryotherapy of renal tumors is a safe and feasible option of treatment and the technique would constitute a good alternative treatment option to surgery for selected kidney tumors. It would be argued that long-term outcome studies are necessary to enable clinicians to establish if a treatment option of any type of malignancy is good. The study of Dominguez et al.,  appears to be associated with a reasonable outcome but there is the need to undertake a further similar study recruiting a larger number of patients who would be followed up for a long time to ascertain the long-term outcome of the disease. It would be argued that the study of Rodriguez-Faba et al.,  was a good study that contained a small number of patients who were followed up for a relatively short period of time and in view of this there is the need for another study that would recruit a larger number of patients who would be followed up for a long period of time to determine the long-term outcome of patients who have undergone the procedure. It would be argued that even though the results of Khoder et al.,  do appear promising, there is the need to convince all and sundry that cryoablation (cryotherapy) would be a gold standard alternative treatment modality for small renal tumors which could be achieved by undertaking a large-scale random controlled trials recruiting patients of all age groups who can be followed up for a long time and if the results are proven to be good in the long-term then cryo-ablation (cryotherapy) can then be recommended to be considered as an option of choice for the treatment of small renal tumors of all age groups rather than for the old and frail patients who are not fit to undergo open surgery. It would be argued that the results of Sisui et al.,  are promising; nevertheless, there is the need to undertake a larger multi-center trial recruiting patients of all age groups who have small renal tumors and who would be followed up for a longer period of time in order to establish the long-term outcome of cryo-ablation in small renal tumors. It would be argued that considering that the longest period of follow-up for laparoscopic cryotherapy was only 93 months, there is the need for a large multi-center study that would recruit a very large number of patients of all age groups who would be followed-up for many years to determine the long-term outcome of patients pursuant to laparoscopic cryotherapy. It would also be stated that it is only after the long-term outcome following laparoscopic cryotherapy for small renal tumors is known that laparoscopic cryotherapy would be promulgated as a good first-line treatment option for small renal tumors. Yan et al.,  undertook a study to evaluate the feasibility, safety, and therapeutic effects of percutaneous renal cryoablation under local anesthesia with conscious sedation for patients who had unresectable stage 1 (T1N0M0) Renal Cell Carcinoma (RCC) in high surgical risk Yan et al.,  reported 18 patients who were not candidates for surgical operation who had undergone primary cryotherapy guided by gray-scale ultrasound. Contrast-Enhanced Ultrasonography (CEUS) and contrast-enhanced Computed Tomography (CT) were undertaken to evaluate treatment at the completion of treatment (Figures 1 and 2). They reported that the followup period had ranged between 12 months and 56 months and the mean follow-up was 26.8 months. All tumors were biopsied preceding cryotherapy. Seventeen tumors had remained free of enhancement during the period of follow-up. They did not find any major complication associated with the cryoablation procedures, although two instances of sub-capsular hematomas, one of retroperitoneal errhysis and one of nausea were observed pursuant to cryoablation. One patient did develop a local recurrence of a tumor who did receive additional cryoablation. The local tumor control rate was 100% of T1N0M0 tumors including the recurrence case who had undergone additional cryoablation. Yan et al.,  concluded that percutaneous cryoablation could be recommended as a feasible, safe, and promising option of treatment for a renal tumor, especially those unresectable stage 1 RCC, with a low risk of complications. 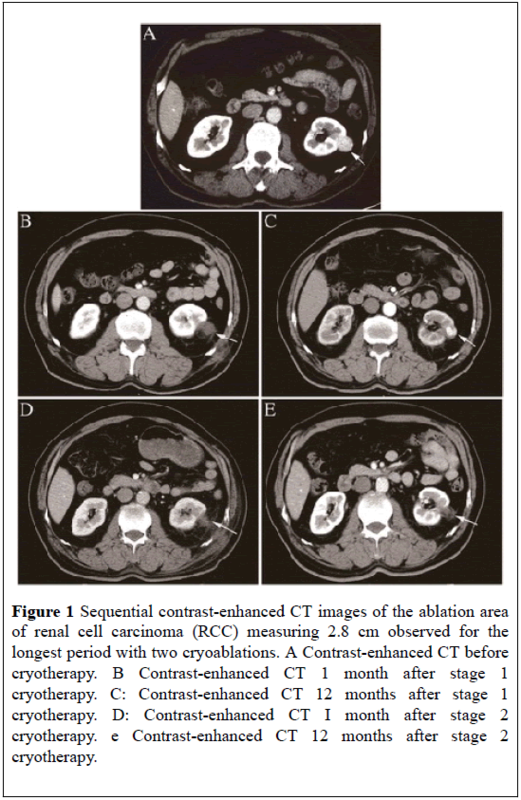 Figure 1: Sequential contrast-enhanced CT images of the ablation area of renal cell carcinoma (RCC) measuring 2.8 cm observed for the longest period with two cryoablations. A Contrast-enhanced CT before cryotherapy. B Contrast-enhanced CT 1 month after stage 1 cryotherapy. C: Contrast-enhanced CT 12 months after stage 1 cryotherapy. D: Contrast-enhanced CT I month after stage 2 cryotherapy. e Contrast-enhanced CT 12 months after stage 2 cryotherapy. Figure 2: Sequential contrast-enhanced ultrasound images of the ablation area of renal cell carcinoma (RCC) observed for the period with two cryoablations. A: Contrast-enhanced ultrasound 1 month after stage 1 cryotherapy. B: Contrast-enhanced ultrasound 12 months after stage 1 cryotherapy. 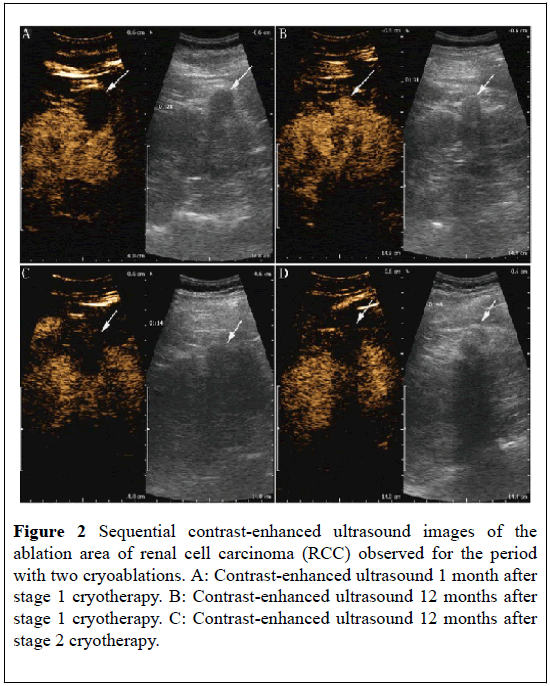 C: Contrast-enhanced ultrasound 12 months after stage 2 cryotherapy. The reported global experience related to cryotherapy of localized small kidney tumors has indicated that small kidney tumors could be safely and effectively treated by means of cryotherapy (percutaneous, laparoscopic, or open surgical cryotherapy). Cryotherapy of small renal tumors tends to satisfactorily treat small localized renal carcinomas with very minimal complications and with a very low incidence of residual disease which can be detected by using control contrast CT or contrast MRI scan and any residual disease identified can be re-treated with cryotherapy or surgical excision. The short- and medium-term outcome of cryotherapy of small renal tumors is good but there is need for further large-scale multi-center trials on cryotherapy of small localized renal tumors to ascertain the long-term prognosis associated with the procedure in order to recommend the procedure as a globally accepted alternative option of treatment as opposed to partial nephrectomy (open or laparoscopic). Percutaneous cryotherapy of small renal tumors could be safely and effectively undertaken on patients with co-morbidities and old patients in order to reduce morbidities and complications associated with open or laparoscopic surgical operations and to reduce the duration of hospital stay associated with the treatment of small localized renal tumors. Considering that the long-term outcome following treatment of small renal tumors with cryo-ablation (cryotherapy is not known or generally documented, there is a global need for a large-scale multi-center trial to ascertain the long-term outcome of this treatment modality before one can be promulgated as a treatment option for small renal tumors associated with a good long-term outcome. Mohammed A, Miller S, Douglas-Moore J, et al. Cryotherapy and its applications in the management of urologic malignancies: A review of its use in renal and prostate cancers. Urol Oncol. 2014;32:39.e19-39.e27. Unger JG. Cryotherapy. Medscape medicine. 2017. Aboumarzouk OM, Ismail M, Breen DJ, et al. Laparoscopic vs Percutaneous cryotherapy for renal tumors: A systematic review and meta-analysis. J Endourol. 2018;32:177-83. Enikeev DV, Glybochko PV, Alvaev YG, et al. Ultrasound-guided percutaneous cryoablation of renal tumors: Urologia. 2017;3:68-73. Pessoa RR, Autorino R, Laguna MP, et al. Laparoscopic versus percutaneous cryoablation of small renal mass: Systematic review and cumulative analysis of comparative studies. Clin Genitourin Cancer. 2017;15:513-519 e5. Bertollo M, Siracusano S, Cicero C, et al. Cryotherapy of renal lesions: Enhancement on contrast-enhanced sonography on postoperative day 1 does not imply visible tissue persistence. J Ultrasound Med. 2017;36:301-310. Lalloue F, Ruffion A, Valette PJ, et al. Cryotherapy percutaneous for renal tumors: Our center’s beginning experience. Prog Urol. 2016;26:310-8. Dominguez A, Bellido JA, Munoz Rodriguez J, et al. Retroperitoneal and transperitoneal laparoscopic cryotherapy for small renal masses. Actas Urol Esp. 2015;39:582-87. Rodriguez-Faba O, Palou J, Rosales A, et al. Prospective Study of ultrasound-guided percutaneous renal cryotherapy: Case selection as an optimization factor for a technique. Actas Urol Esp. 2015;39:8-12. Khoder WY, Siegert S, Stief CG, et al. Results of a prospective study comparing the clinical efficacy of cryoablation of renal cell cancer followed by immediate partial nephrectomy. Eur J Surg Oncol. 2014;40:96-102. Sisui DM, Liss MA, Palazzi KL, et al. Renal nephrometry score is associated with complications after renal cryoablation: A multicentre analysis. Urology. 2013;81:775-80. Cordeiro ER, Barwari K, Anastasiadis A, et al. Laparoscopic cryotherapy for small renal masses: Current State. Arch Esp Urol. 2013;661:41-53. Long CJ, Canter DJ, Smaldone MC, et al. Role of tumor location in selecting patients for percutaneous versus surgical cryoablation of renal masses. Can J Urol. 2012;19:6417-22. Yan X, Zhang M, Chen X, et al. Image-guided percutaneous renal cryoablation for stage 1 renal cell carcinoma with high surgical risk. World Journal of Surgical Oncology. 2015;13:200.